I love just about all things banana. I can’t say all things anymore because I recently had a banana Slurpee and that was nasty! LOL! I had an allergic reaction to something the other day. The ARNP I saw for it went over the foods I had eaten and the activities I had been doing and narrowed it down to 3 possible triggers, peanut butter, bananas, or pool chemicals. I am still in the eliminating phase so I haven’t eaten either food or gone back to my water workouts yet. I am so sad to think I may have to eliminate any one of those three things from my life just depresses me. If I could never have my mother’s Banana Bread, or my Amish Peanut Butter Pie again I’d be so upset. Since joining the Y 6 weeks ago I have enjoyed my water workouts 3-5 days a week and I love it! I actually enjoy exercizing, I’d hate to give that up too. 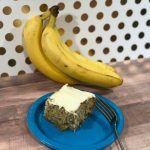 In the hopes that I will be able to enjoy this again, today I am sharing My Favorite Banana Cake Recipe. 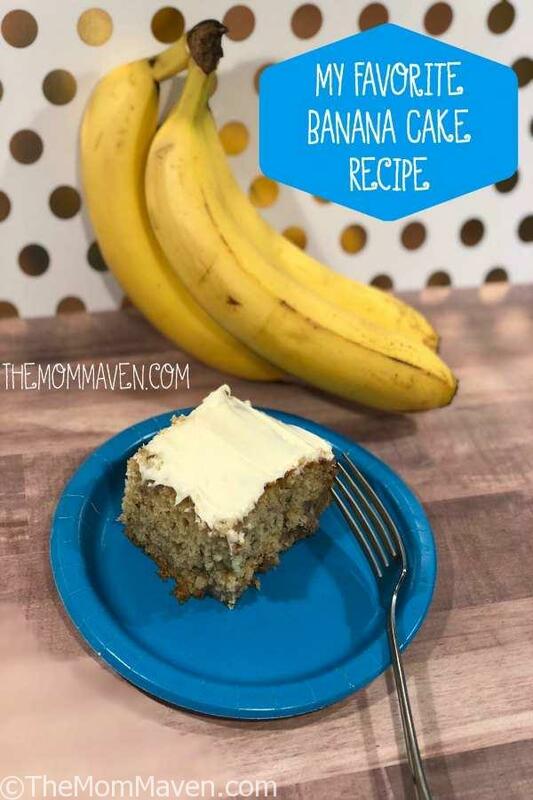 I found this banana cake recipe on Facebook. I kept seeing a recipe video of this delicious looking banana cake in my feed. It comes from Spend with Pennies. I just had to make it and share my thoughts on this delicious cake with you. Over at Spend with Pennies Holly has her recipe for this cake with a homemade cream cheese frosting. I took the shortcut and used canned frosting so if you want her frosting recipe, hop on over there to get that. Place 1 1/2 tablespoons of lemon juice in a 2 cup measuring cup. Fill to 1 1/2 cups with milk. Set aside. Mix together mashed banana with 1 tablespoon lemon juice and set aside. In a large bowl, beat together butter, brown sugar, granulated sugar until combined. Mix on high until light and fluffy (almost the texture of frosting). Alternate adding the flour mixture and the milk to the egg mixture stirring just until combines, don't over mix. Put in oven. Reduce heat to 300°. Bake 60-70 minutes, until toothpick inserted in center comes out clean. Remove from oven and place directly into freezer for 45 minutes to make the cake extra moist. Because ovens vary start checking your cake for doneness at 55 minutes. I thoroughly enjoyed this cake and I can’t wait to make it again. I hope you enjoy this recipe and all of the easy recipes I share here on The Mom Maven. I hope you share them on your social networks. I just ask that you not copy and share the entire recipe with photos. Please use the sharing buttons below and share the link to this post. Thanks!